Why was my Philhealth Deduction for my Cesarean Section operation only 11,600 pesos? Philhealth says my Case Rate coverage should be 19,000 pesos. and should deduct 7,600 from the fees of the ob-gyne and the anesthesiologist. based on many comments on our blogs.
. The 7,600 coverage, when paid by Philhealth, will be given to the ob-gyne and/or the anesthesiologist as additional PF.
. The 7,600 coverage is in addition to the PF agreed upon with the ob-gyne before the CS operation. After all, the ob-gyne can quote any PF amount, as long as the patient agrees.
. 7,600 pesos is NOT CASH. It is to be paid by Philhealth months after filing. There might be reasons some doctors or hospitals do not deduct this 7,600 pesos from the bill.
. “It’s common practice” daw.
. 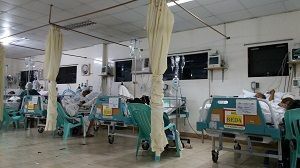 The 7,600 pesos will be refunded when the hospital receives its reimbursement from Philhealth.
. When you receive your benefit payment notice (BPN) from Philhealth, go to the hospital with a copy of your bill, payment OR, BPN and ID and refund your 7,600 pesos.
. Ask to speak with the billing/collection/accounting manager or the head of the hospital.
. File a complaint with Philhealth. Bring supporting documents.
. File a complaint with DOH. Bring supporting documents.
. Write to newspapers, online news sites, etc. about your case.
. Write about your case on the Facebook page of Philhealth. Or you can just consider your 7,600 pesos as a gift or token of appreciation. If the hospital says they have given your 7,600 as additional professional fee to your ob-gyne and anesthesiologist, and you were given excellent care by them, then just think your 7,600 is your token of appreciation for their service, especially if the cash that you paid them is not that much compared to the professional fees charged by other doctors for CS. Hi Ann, you can avail, make sure his agency is paying his Philhealth, at least June July Aug. Or to be sure, from Mar to Sep 2014. Hi Daisy, yes you can avail as long as CS is indicated by your ob. Find a Philhealth-accredited ob and hospital. Hi teresa, ask your husband to email you a copy of his OEC or Philhealth receipt and an authorization letter authorizing you to update his MDR and process all Philhealth papers. Then you go to Philhealth with your marriage cert (orig and xerox) and ID and update your husband’s MDR (write yourself as beneficiary). God bless too. Hi po gudpm..! !dependent po ako,seaman po asawa ko.,naka Sampa po sya nung April 2014.,manganganak po ako this coming sept CS po.,makaka avail po ba ako as philhealth. ?april to dec po ang hulog ng company nila..! Hi po, nanganak po ang hipag ko today, na cs po sya, ngayon hindi po pala nila na renew yung philhealth nila, 2years na. Kapag po ba binayaran nya yung 2years na yun sa philhealth makaka avail pa rin po ba sila? Salamat po. Hi I’m confused. I had cesarian delivery last march 28,2014. We paid 21k and we were not given a receipt. According to the hospital, they don’t issue receipts if discounts are given. My husband is a Philhealth member. Philhealth told us we should have been given the 19k coverage. We can no longer get back the 21k we spent. What we got were our papers for claim filing but Philhealth told us self-filing has been disallowed since January. Hi dette, sad to know of your situation. Thanks for sharing. I hope others will learn from your experience. Philhealth should have done more to inform their members of their policy change in claim filing. If you like, you can post your comment on the Facebook page of Philhealth. and manganganak ako sa november, may possible daw na ma c.s. privte po yung panganganakan ko. okey lang po ba yun kahit wala nmn ako hulog at mag kanu po ba ang covered ng philhealth pag CS at NSD.? Hi catherine, if you have your sponsored Philhealth card in your name and the validity dates Jan to Dec 2014, then you will be covered. Get your MDR from Philhealth. IF CS, it should be in a hospital, and the decision on whether it’s CS or normal should be decided by the ob-gyne, so you’ll be covered. Find a hospital that offers lower rates for CS, so you don’t have to pay a big balance. Hi Erika, tubal ligation can be covered as second case. But there’s a circular that says the coverage for CS is 19k, whether it is with or without tubal ligation. Maam, my edd is dec 2014, i paid for the m0nths of april-sept 2014, can i avail of my benefits? Tnx. Hi ireen, did you file your Philhealth with the hospital? How much was your deduction? If your Philhealth deduction was 19k, you have received your full benefit and there’s no more refund. Hi. Im currently pregnant and will deliver by january through 3rd cs. My last payment was from January to June 2014. But for almost 4 years I paid philhealth. I’m unemployed since last June 2014. Can I still avail my philhealth? Thanks. Hi Lourdes, you should pay asap for Oct Nov Dec 2014 so you can avail in Jan 2015. Hi ma’am good evening, I haven’t paid Philhealth for more than a year. I want to pay because march is my sched for cs. can I still avail? Hi Nissa, pay asap for Oct Nov Dec 2014, and then for Jan to Feb 2015. Xerox your receipts. Hi. can i file a late maternity claim for my delivery last year november11, 2013. ceasarian section, public hospital. My company said they’ll file but they have not filed. I spent 11,000 for meds/supplies bought outside the hospital. The hospital said my company did not file. Can I claim what I spent? Thanks. Hi! Ask about my phil health. I’m Ofw and I’m giving birth in pilipinas. I paid for 1 year to philhealth. Can I use it this coming december 2014? I’ll be having CS and I’m worried about hospital costs. I’ll use Philhealth for the first time. Do you have any idea how much I can avail from philhealth? bikini session is the style of my cs? Thank you and Godbless! Hi Whenzy, is your MDR or receipt says you’re OFW? Do your premium receipt dates cover Dec 2014? If yes, then you can avail in Dec. The coverage for CS is 19k pesos. But talk with your doctor about total cost and if 19k will be deducted, so you can prepare. There are doctors that you have to pay much, from 30k to 50k and upwards, even after the 19k is deducted. Hi Rea, yes, you can avail in Jan. Ask your hospital/ob-gyne about their Philhealth policy. I am not aware about this just until now that I’ve read and came across this forum. I really want to ask why it was only 11k deducted only from the hospital bill. It’s been 1 year and 9 mos already and we will be having our second baby on the expected month of Feb 2015. Can we still ask for a refund for the 7,6k? Because I remember we paid complete cash for the PF. Hi Gab, 7.6k should have been deducted, but sorry I’m not sure if you can still refund it as it’s been nearly 2 years. They’ll most likely say the 7.6k was additional to the PF. But you can ask the hospital, if you decide so. Hi, last payment to philhealth was 2012,then i updated july 2014 and paid July -dec 2014. can i use philhealth for my delivery this feb2015? Hi! if philhealth membership is activated this January, can i avail next month due to give birth by cs? Hi Joyce, if you paid Jan to March but did not pay Oct to Dec, sad to say, you might not be able to avail in Feb. If you give birth in Mar, yes, you can avail. Ask others too. Update ko lang po, thanks sa philhealth, binayaran lang namin yung buong 1year na contribution for 2015 at na avail namin yung 11,900 na benifits. from 12,900 na bill naging 1k na lang binayaran namin. Thanks philhealth ang laking tulong nyo po. Hi Laarnie, yes, you can avail. Hi rizielle, do you mean you paid Jan to Dec 2015? If yes, you are covered. If you paid for April to June, yes you can use it in June. Hi Beatriz, do you mean there was no 19k deduction in your bill? Check your bill if there’s Philhealth deduction. I’m puzzled that only the newborn benefit was reimbursed. Wait for your benefit payment notice from Philhealth. Check how much Philhealth paid to the hospital, and ask the hospital for refund if there’s discrepancy. Keep and xerox your receipts and documents. Hi my due is on last week of march 2015 for CS delivery i have paid oct-dec 2014 and jan-march2015 how much discount to avail for CS. My doctor told me it will cost me 70k hoping for a bigger amount to avail.. And if ever what to bring on the big day? Just my philhealth id and xerox receipts? Thank you! Hi mark anthony, do you mean you were not able to pay your Philhealth as OFW? If not, your wife can pay asap for March to June or March to July at Philhealth so she can avail. hi! good noon. Is pf covered by philhealth if cs. is there excess cost that we need to pay? Hi trixie, you need to talk to the ob. Usually, Philhealth coverage is not enough. CS coverage is only 19k (11400 for hospital and 7600 for pf. Find a government hospital in which your Philhealth is enough. Ask for No Balance billing. My cousin was already been discharged in the hospital a week ago, and CS as the operation to her was covered by the Philhealth but Doctor’s fee was not covered for she was considered a private doctor that time. In line with this, I would like to ask if the medicine brought outside the hospital can be refunded by the Philhealth? If yes, please advice what shall I do. Hi, Nora, my OB told me her package for my delivery is 25K if NORMAL, 35K if CS, can increase depending on my and my child’s condition. Philhealth is already included in the package. Please advice. How much really is the cost? Hi Anna, that’s your OB’s Philhealth package, so that’s her rate. Doctors can really dictate how much they want because hospital rates are not regulated by the government. Compared to others, her rate is reasonable. I know someone who gave birth via normal delivery at a small clinic and she paid 30k with Philhealth and that was in 2014. Take care. Hi Crisanto, wait for your benefit payment notice from Philhealth via mail. You can see in your notice the amount paid by Philhealth to the hospital. If Philhealth paid 19k to the hospital, xerox your notice and hospital papers, and ask for refund from the hospital. Hi po, is it possible to have 2 philhealth account? I’m currently employed and my company is paying for my philhealth and at the same time my mom included me in her application for the free philhealth sponsored by the government in our province and sabi ni mama updated ang payment ko don kinuhanan na rin nya ako ng mdr. If yes po, can I get the same benefit kahit aling philhealth record ang gagamitin ko? My mom told me kase na yong pinsan ko who gave birth just this week cs sya ang her hospital bill was about 86k eh ang binayaran lang is 15k using the philhealth sponsored by the government. Pls help po I’m about to gave birth anytime kasebin a public hospital painless sana and as per my ob nasa 25k ang babayaran ko less philhealth na yon and that includes everything na parang package and if cs daw I will pay about 35k. Hi Hiedel, you can only use one Philhealth membership. Because you’re Employed, it’s your Employed membership which is your correct membership. Your sponsor does not know you have Philhealth — that’s why you were accepted into their program. Anyway, Philhealth benefit amounts are the same for all types of members for the same medical condition or treatment. Siguro ang advantage lang ng sponsored sa province ay isipin ng compassionate OB “ay sponsored ito, siguro bigyan ko ng discount”, but I’m not sure. CS coverage is only 19k, so I’m pleasantly surprised that your cousin got a deduction of 71k. Did the doctor give her a 52k discount? Is your province very far? You can ask for more info from your cousin. About your OB’s package, her rates are about average, based on rates mentioned by those commenting here. Philhealth’s coverage for normal delivery is only 5k. Hi darwin, dahil hindi kayo kasal, dapat ang Philhealth member ay si misis, your wife, so she can avail of Philhealth. Hindi mo siya puedeng dependent kasi wala pa kayong marriage cert na ma-present to Philhealth. About use of 2 Philhealth: Kapag pareho kayong merong Philhealth, hindi puedeng 2 Philhealth ang magamit, isa lang, even if you were married. Good day! Just want to ask because i’ll be having cs delivery this coming nov, is myomectomy will be considered as second case? If so, how much the coverage? Thanks! Hi Rose, sorry, wala sa list of second case rates ang myomectomy or CS. Coverage for abdominal myomectomy is 23,300 pag ito ay separate procedure. Ask your OB-gyne so you can prepare. Hi Lhian, the payment deadline for any quarter is the last day of the quarter. Yes, pay asap this month for July to Dec so you can use it in Sep or Oct. If your MDR is not updated or no longer clear, pay at Philhealth so you can get your new MDR. Hi ms. Nora.. magkano dapat contribution ko para maka avail ako sa 19k coverage ng philhealth..cs po ako sa 1st baby ko..and sa november na ang due ko..resigned na po ako since 2015..if i avail for this month of june until december, can i avail the amount of 19k for cs?thanks po..
Hi Ayenna, pay for July to Sep ASAP — puede na ito for November, but pay also for Oct to Dec for continuous coverage. Yes, covered ang CS kung CS ang decision ng doctor. Hello po, manganganak po ako sa July 30 at active philhealth member po ako. If ever po normal delivery po ako may makukuha po ba akong deduction galing sa Philhealth at magkano po if sakali? Hi Melanie, 5k lang ang coverage for normal delivery sa hospital. 3k for hospital and 2k for the doctor. Most of the time pa, yong 3k lang and dinededuct. Hello po, ask ko lang kung covered pa po ako ng philhealth? 4 babies via NSD tapos ngayon po sa April manganganak ako pero sabi po ng OB CS kase may chronic hypertension ako. Hi ruth, oo maco-cover ka. Tinanggal na nila yong limit na 4 normal deliveries. Pag CS, hindi binibilang noon pa. Para sure, ask mo yong billing dept. ng hospital next time magpa-chekup ka. Hello po good morning ask ko lang na cs poh anak ko now .2/16/2018 Hindi pa kasal .diyan sarah mother care poh.magkano poh babayaran namin ..
Hi Rowena, ang Sarah Mother Care ba ay name of clinic? Tanungin nio po ngayon na sa Billing section nila kung magkano ang babayaran nio. Ang deduction is 19k, pero ang actual na madeduct doon sa PF portion (7400) ay depende sa doctor at sa clinic. Hi Ivy, yes, covered ang April delivery mo, buti na lang nakabayad ka last month ng for Jan to March. Hi po mam nora ask q lng poh cs ang asawa q kng my 19k benefits poh sya makukuha s philhealth bkt kme poh ang bumibili ng gamot kme nag bayad ng laboratory pti hospital bill db db dpt m less n agad un? My refund p poh b kme makukuha nun.. Matagl n poh member ng philhealth wife q at s goverment hospital lng poh sya n nganak..
Hi Macky, nag-submit kayo ng Philhealth papers sa hospital? Tinanggap? Dapat merong deduction na 11,400 (hospital costs). Yong 7,600 na for PF, hindi na dinededuct kung libre ang mga doctors. Kung walang deduction, ipunin ang mga receipts para maka-refund later on from the hospital. Kung walang budget ang government hospital, ganyan ang practice. At nagrerefund na lang kapag natanggap na yong payment from Philhealth. good day, ask ko lang po sa aug po ang due date ko anong month po ang need ko na mahulugan para maavail ko po ang maternity benefits sa philhealth, unemployed na po ako since 2016 at magkano po ang monthly na huhulugan ko sa pag update? thank you and GODBLESS. Hi Jen, pay asap for Apr to June, and then in July, pay for July to Sept. Puede ring bayaran mo na agad ang Apr to Sept.
Hi aslima, yes, you can avail. Use your Dec 2017, April May 2018 as your compliance to the 3 months within 6 months payment requirement. Ask mo yong hospital in your next checkup para sure at para hindi ka stressed. hi miss nora good day po. ask ko lang po kasi due date ko is oct.5 kaya lang d p ulit ako nkakapagbayad ng philhealth..if magbayad b ako ng july to september..magagamit ko p dn b ang philhealth ko?? Hi toneth, sorry hindi kasi starting Oct 1, nine previous monthly payments na ang required. Pumunta ka sa hospital where you will give birth at tanungin mo kung puede ka sa Women about to give birth program at kung anong mga months ang dapat mong bayaran. Hi miss Nora matagal na po ako un employed at Hindi narin nakakapaghulog manganganak po AQ sa seamans hospital ang due ko po is april by CS section ang sabi ng obgyne mag pay ako under WATGB Women about to give birth which is 2,400 ma avail ko po ba ang benefits na 19,000? Kahit Hindi po ako nakkapaghulog Basra mabayaran ko yong 2,400??? Hi Florence, yes, tama ang ob-gyne mo. Pumunta ka sa billing or accounting, at tanungin mo kung puede ka nang magbayad this March sa Philhealth ng 2,400 para maka-avail ng Women about to give birth program, kasi meron ding rules when to pay, at baka meron ding silang sariling rules.